When I awoke next morning Sam had already prepared an elaborate breakfast for me – none of your nancy-boy continental breakfasts here. It consisted of vast quantities of different meats and cheeses along with freshly baked breads and fresh fruit. It was an enormous challenge to the appetite but delicious. As expected, Sam had planned a full morning’s sightseeing for me, to be followed by lunch back at home before venturing out again in the late afternoon for more visiting. But today would be different. Sam decided that it would be easier to use public transport rather than the bike so we walked up to a nearby bus stop and caught a local bus into the city. The bus ride took about 20min during which time I was the cause of much curiosity for locals. Apart from salaam aleikum and aleikum as-salaam I couldn’t converse with the locals but Sam was very enthusiastic in introducing me to as many people as possible on the bus. Our first stop was another, but more in-depth, visit to the famous Tabriz bazaar. The scale of the bazaar was mind-boggling. One could easily get lost in the intricate web of darkened alleyways and secretive caravanserai. From the bazaar we made our way to the elegant, Tabriz Municipality Building. 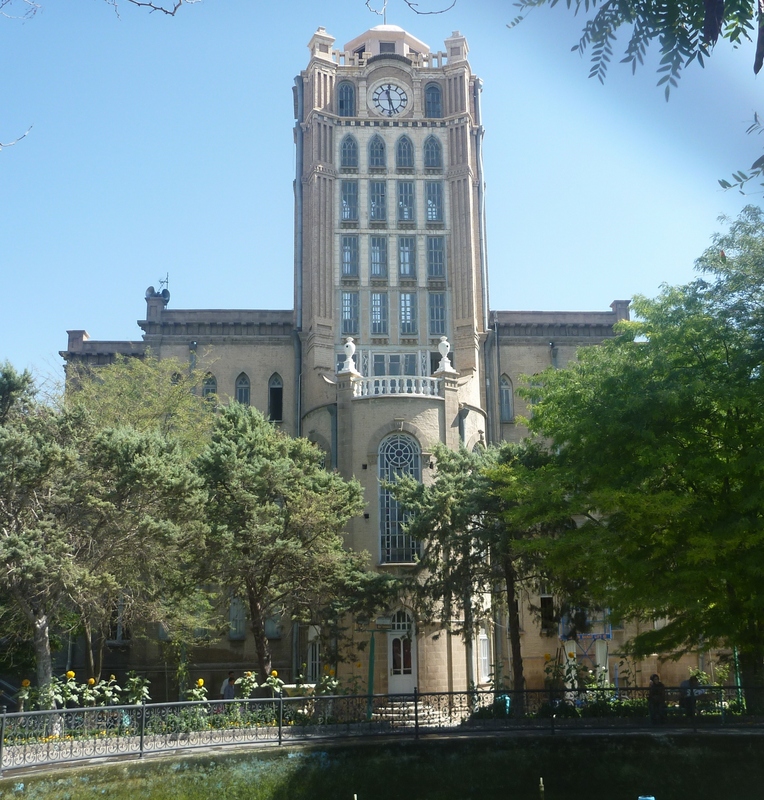 It was built in the early 20th century by the Germans and now boasts many separate small museums including the Tabriz Municipal Museum and the Tabriz Carpet Museum. 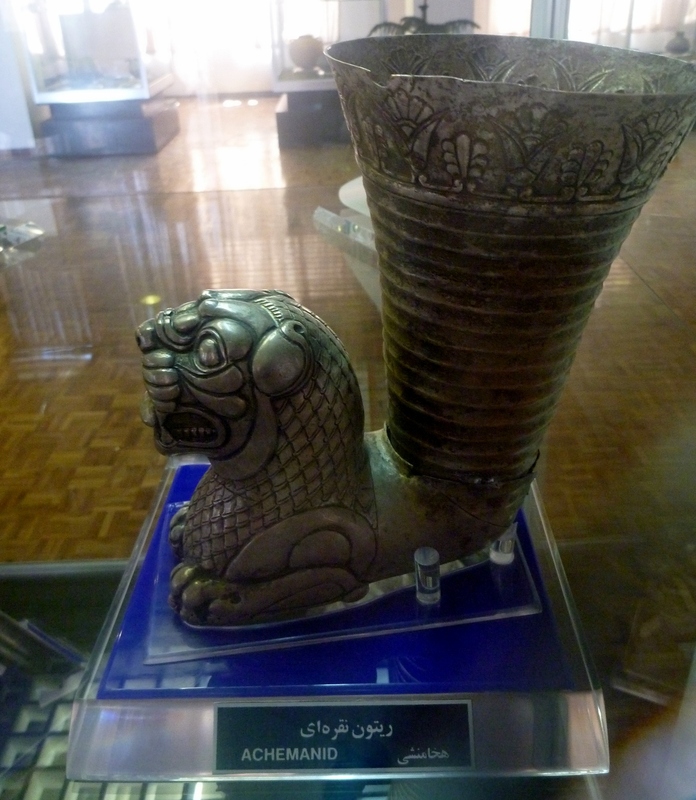 The Municipal Museum housed an eclectic collection of quaint bibs and bobs from 19th and 20th century Tabriz. The outside exhibits included odd things like a collection of early 20th century fire engines and the first taxi in Tabriz (an old W120 Mercedes Benz). Inside, the museum seemed to be dedicated to famous Tabrizi citizens. Important no doubt, but not very rivetting for an outsider. The small gardens surrounding the building were beautiful, spoilt only by the huge fountain which had been drained for repairs. Now that’s a carpet! This priceless antique carpet measures 16m by 7m. That’s Sam in the far upper left corner. 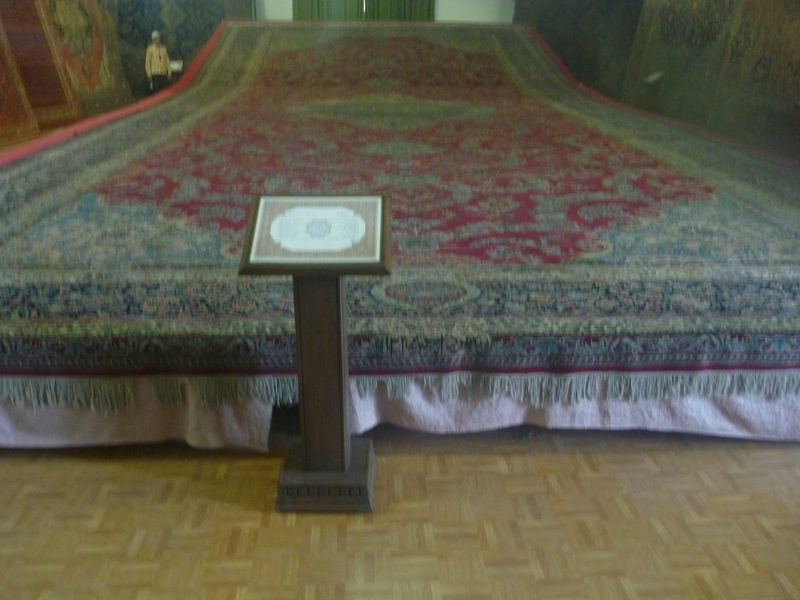 In a different wing of the Municipal Building was the Tabriz Carpet Museum. The highlight of the Carpet Museum was a massive hand-woven carpet measuring 16m by 7m. I asked the museum attendant about the history of the huge carpet but she was only able to tell me that it was “rescued from a wealthy person’s house”. Not really sure what that meant. Next on Sam’s seemingly endless list of museums was the modest-looking Azarbayjan Museum. 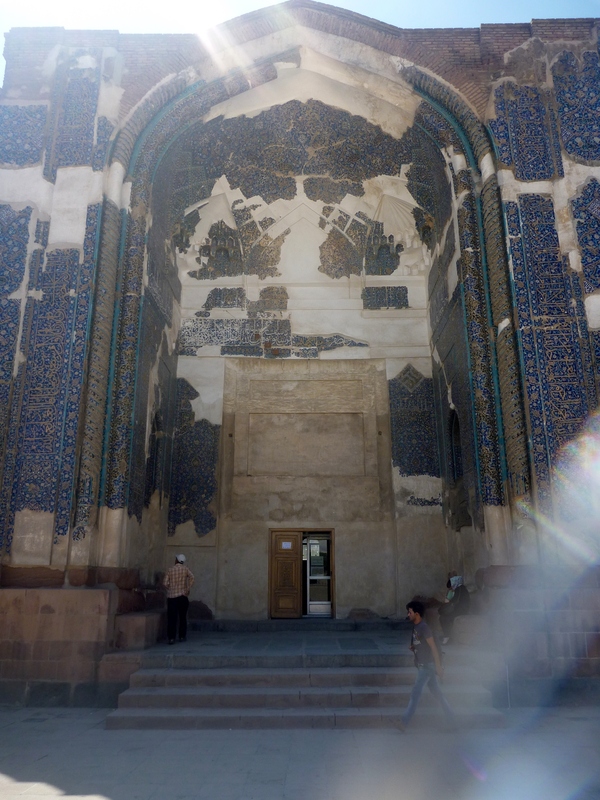 It was only mid/late morning but the day was already starting to get uncomfortably hot and, with all the tramping around the streets of Tabriz, I was quickly approaching museum overload. I waited outside while Sam haggled with the guard about something, all the time fearing the Azarbayjan Museum would turn out to be nothing more than another local council museum. Once inside, the Azarbayjan Museum turned out to be anything but another local museum. I was astounded. This was a real museum with artefacts that were professionally displayed. Some items predated Alexander the Great gate-crashing the Persian party in 334BC. There was a vast collection of Achaemenid artefacts including a truly stunning solid silver drinking goblet. Having missed the major museums in Tehran because of Ramadan, this museum was an unexpected bonus. And it was airconditioned, so I took my time in the museum enjoying the exhibits/air-conditioning. I was learning more and more about the historical and cultural links between Tabriz and the neighbouring country of Azerbaijan. Indeed, Tabriz is the capital of the province of Iran called East Azerbaijan. 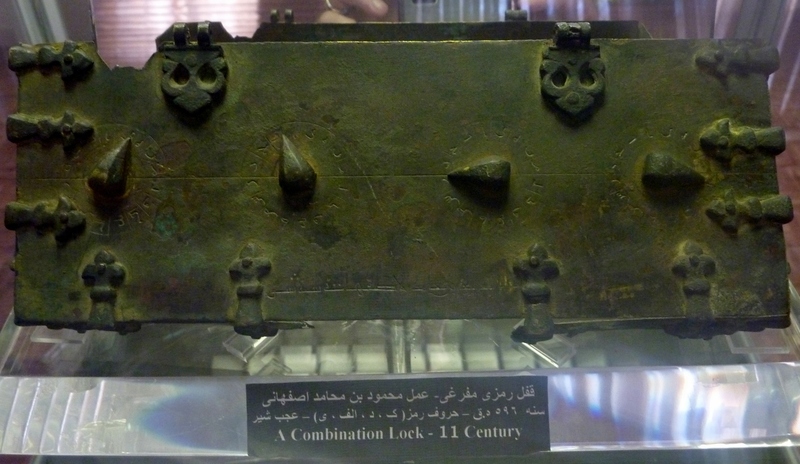 Amazing piece of ancient technology – an 11th century combination lock. The Blue Mosque undergoing much-needed restoration. Not far from the museum was our next stop – the famous Blue Mosque. The mosque was completed in 1465AD under the orders of Jahan Shah. At the time it was considered one of the finest example of 15th century Islamic architecture along with the Uleg Beg madrassah in Samarkand. The mosque has been severely damaged in several earthquakes, the last time in 1779. Slowly it is being restored but it will be a very long time before it regains its former splendour. After the mosque, I had completely overdosed on sight-seeing and suggested to Sam that we skip the remaining sights on his extensive list and head home for a break. He readily agreed and promptly resumed his earlier task of introducing me to all and sundry on the bus home. Back at home, Agdaz had prepared another banquet fit for six people. I tried valiantly but failed miserably in eating my share of the six or seven dishes. After such a huge lunch I could feel it was time for a siesta. In another case of “while I was sleeping” Sam came up with new plan for the rest of the afternoon and early evening. First, we would go for a swim at the local swimming pool, then meet some more of his family before heading home for dinner. Going for a swim sounded pretty appealing to me as it was still quite warm in the late afternoon. 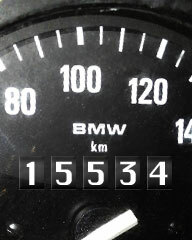 As the pool was not far away and the worst of the traffic had died away, we took the bike. Sam was always keen to go for a ride on the back of the bike. The swimming pool was not like your typical local Australian swimming pool. It was part of a large up-market residential complex. After completing an bewildering sequence of pre-pool entry requirements eventually we got to the large indoor pool. Immediately I noticed this was NOTHING like an Australian pool. There were no kids running around sreaming and jumping and pushing each other into the water. And there were no females. The pool was populated almost exclusively by middle-aged Iranian men. And the pool served more as Iranian version of a Turkish bathhouse than a swimming pool. As a westerner I found the other patrons getting up close and personal with each other a bit off-putting initially but eventually I put my cultural bias to one side and joined in the rituals of swim/spa/sauna/cold pool/massage. It was quite invigorating really. But I had to draw the line in the showers though! By the end of the 90min session I had seen enough naked Iranian male flesh to last a lifetime. Sam had received a message to say that his family had been called away so we would have to skip the visit and we enjoyed the ride home in the cool of the evening. I had only been in Tabriz 2/3 days and was getting to know my way around the city. I was beginning to feel as if I was a local – something that didn’t happen in either Mashhad or Tehran even though I spent longer in those cities. Back home earlier than expected, Agdaz had still prepared another feast for us. After dinner Sam and I spent the rest of the evening exchanging more life stories before I called an early night. My stay in Tabriz had been a wonderful snapshot of Iranian culture – family, food and famous places. This is what I had come to Iran to experience. Tomorrow I would have to leave Sam and Agdaz and resume my almost-forgotten journey to Maku and the Turkish border.